It wasn't the high the team wanted to end on but shades of 2017 they won big in game #1 and held on in game #2 to win the series. Intensity seemed to be one of the main factors in game #2, USA had it, Canada with a +38 point lead in the back of their mind, didn't. The Rugby Canada match report by manager Pat Parfrey gives a good account of the match. We saw a few video clips of the match and could see the problem and the concerns for the JWRT tournament. Physicality at the breakdown will be a big issue in Romania. We saw one breakdown from this match where a Canadian back was called upon to secure a ruck and failed, the USA player stole the ball and ran 10 metres before being stopped. Being able to instill that commitment to physicality from all XV on the pitch will be a key component of the preparation. Still winning the series two years in a row and on American soil is a big accomplishment, congratulations. Captain James O'Neill summed up the match and series postgame. Thanks to Judy Teasdale for capturing the video. Canada sealed a 82-62 aggregate victory over the USA to progress to the Junior World Trophy in Romania in August. Based on aggregate scores Canada U-20 qualified for the World Rugby Junior Trophy in Bucharest by a points difference of twenty points. Canada lost to a hyped-up, invigorated USA team in Houston by 40 points to 22. The reality of the day was Canada wilted in the 38 degee heat at Rice University, as USA's athletic backrow and Southern hemisphere midfield dominated the last 25 minutes. The South African scrumhalf and inside centre, together with the New Zealand flyhalf were outstanding. USA rocked Canada with a 14-point start within 8 minutes, as Canada failed to cope with USA's intensity. Canada however, got into the game through a penalty by Brennig Prevost sixteen minutes in, and a try by Elias Ergas, following a multi-phase movement, converted by Prevost. In the last five minutes before half-time Canada were over the line three times but failed to touch down. USA were leading by 14-10 at the break despite playing against the twenty mile per hour wind. Early In the second-half Prevost scored a suberb individual try in the left corner, gathering a short kick at pace. However, USA countered with two fine tries and a conversion. Canada countered with a second Ergas try converted by Prevost, but the last 15 minutes belonged to the USA, who scored 2 converted tries . Man of the match for Canada was Prevost. James O'Neill was outstanding, as was Emmerson Prior coming off the bench at 30 minutes. "We were delighted to qualify over an athletic and skillful USA team, but our frailties were revealed today " commented Jeff Williams, Head Coach. "We have challenges ahead to perform well in Bucharest." Canada have to come out with the same intensity they did on Tuesday when they defeated USA 60-22. I'm sure coaches are trying to get the players into the same mindset and to forget the +38 they bring into the match. Canada's tight five remains the same, they produced a push over try and put the Americans under pressure so no need to change that formula. Smith and O'Neill remain in the loose forwards, Ruttan who had a quiet match by his standards moves to the bench. UVic player Jackson Matthews earns the start at #8. The halfbacks remain the same, Ergas moves from wing to centre, he scored the first try for Canada on Tuesday. Mostyn Findley who came off the bench to score on Tuesday gets the start on wing. Brennig Prevost remains at fullback and is in charge of kicking duties. On the bench Sam Turner from UBC replaces Stephen Mallard in the front row and Brandon Schellenberger takes a role as utility back from the bench. The game overlaps the men's Canada v Russia match which starts at 1pm PT. 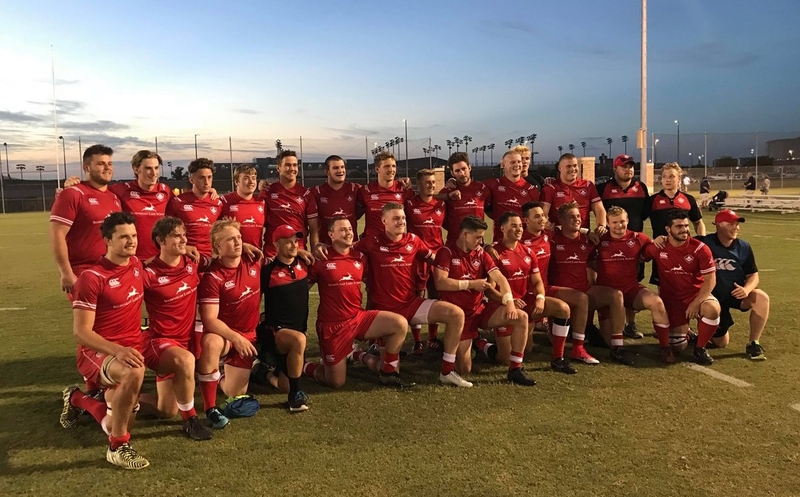 There's no live stream from Houston but last match Judy Teasdale provided video clips which we posted immediately to Twitter @BCRugbyNews, so keep your twitter feed open and hopefully we'll be able to keep you updated. Canada won the first game 60-22 and will take a 38-point advantage into tomorrow’s contest. Seth Purdey had a head knock in the game on Tuesday and has been replaced by Elias Ergas, with Mostyn Findlay coming in on the wing instead of Ergas. Brandon Schellenberger is now the second back on the bench. Jackson Matthews starts this game as number 8 in an exchange with Owain Ruttan, who is now a "finisher". Sam Turner, having recovered from concussion, replaces Stephen Mallard as a replacement prop. The team with highest aggregate difference in scores across the two games qualifies for the World Junior Trophy in Bucharest, Romania August 28 to September 10.